I love trying new things! Summer is all about salads and usually I just make my old stand bys because I know everyone will love them and they scream home, but I have been venturing out in the salad category this summer. I’m so glad I did! This is going to be one of my new go to salads. They layering of different flavors makes my mouth happy. Easy to make and will please any crowd! In a large skillet, warm 2 Tablespoons of olive oil on a medium heat and then add one can of garbanzo beans. Stir and toss until the beans become golden brown and crunchy, this can take about 10 to 15 minutes. With a slotted spoon remove them from the pan onto a plate covered with paper towels, and then set aside. In a medium, toss the tomatoes, bell pepper, cilantro, green onions, and 1 teaspoon salt. In a small bowl, whisk the sour cream, mayonnaise, lime juice, chili powder. Assemble the salad; Sprinkle half of the cornbread in a glass bowl or trifle dish. Top with half each of the garbanzo beans, corn and the tomato-pepper mixture, then half each of the sour cream mixture and cheese. Repeat the layers with the remaining ingredients, ending with cheese. Cover with plastic wrap and refrigerate for at least an hour or even overnight. 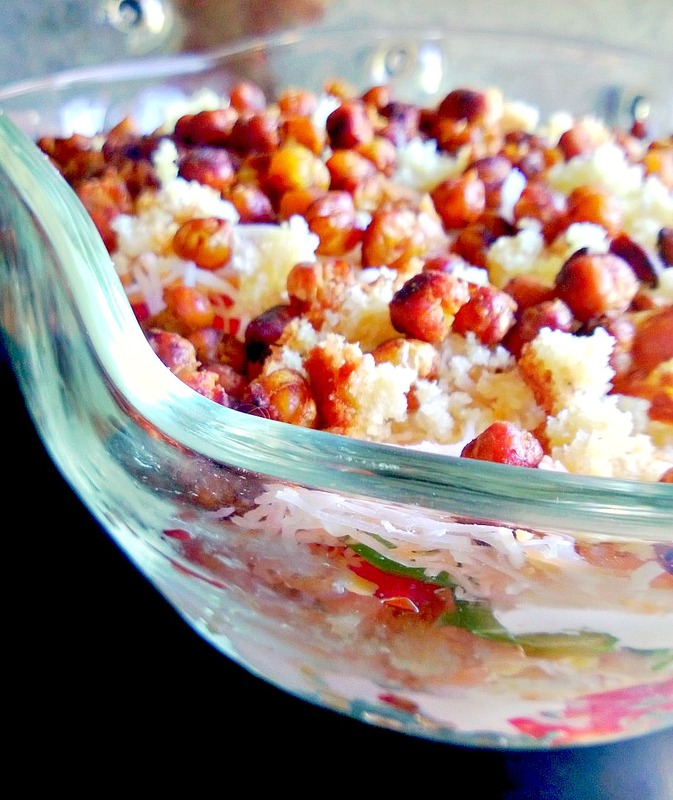 Right before serving, sprinkle roasted garbanzo beans on top of the salad to give it a extra crunch! 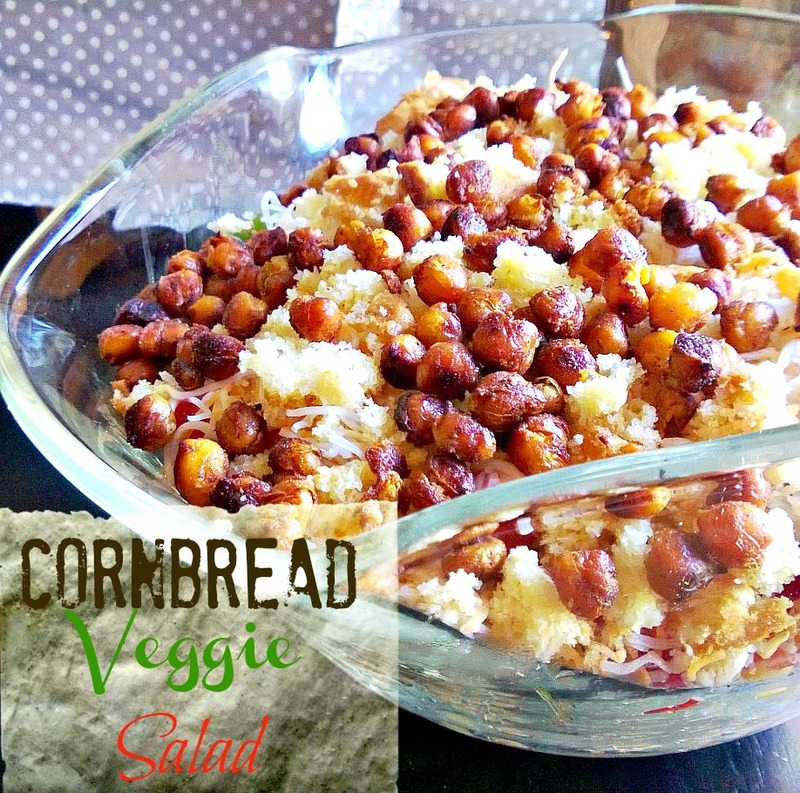 I love cornbread and make it all the time, but I've never heard of cornbread salad. I'm always looking for fun recipes to try. This looks so awesome and those garbanzo beans look incredible! Thank you for sharing this at the #SmallVictoriesSundayLinkup! This looks very interesting. I'll have to try it soon. Thanks for linking up to the Bloggers Brags Pinterest Party. I have pinned to the Bloggers Brags Broad. What a delicious, satisfying salad, Kimberly! It's perfect for summer entertaining, Pinned, will tweet and have shared on Stumble Upon. Thank you for sharing with us at the Hearth and Soul hop. I make a version of this myself!! Love!! Thanks for sharing on My 2 Favorite Things on Thursday!! Hope to see you again tomorrow!! Pinned! What a great recipe that we will love ! Thank you so much for sharing with Full Plate Thursday and have a great day!